Robbie Simpson and Jayden Stockley scored twice each as Cambridge United produced an emphatic win over Carlisle. Issa Diallo drove in from just outside the area to open the scoring midway through the first half before crossing for Simpson to head in a second. Simpson added the hosts' third when he turned in from Tom Elliott's cross. Debutant Stockley scored two in five minutes, heading in Greg Taylor's ball before flicking in from Bobby-Joe Taylor's free-kick. Match ends, Cambridge United 5, Carlisle United 0. Second Half ends, Cambridge United 5, Carlisle United 0. Corner, Cambridge United. Conceded by David Symington. Goal! 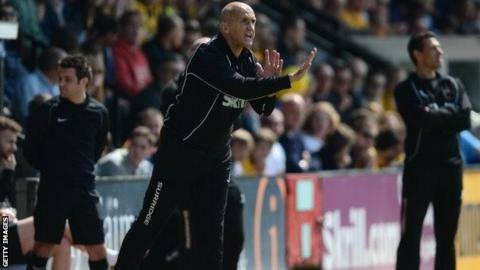 Cambridge United 5, Carlisle United 0. Jayden Stockley (Cambridge United) header from the centre of the box to the bottom left corner. Assisted by Bobby-Joe Taylor. Liam Hughes (Cambridge United) wins a free kick on the right wing. Substitution, Cambridge United. Bobby-Joe Taylor replaces Ryan Donaldson. Attempt saved. Jayden Stockley (Cambridge United) right footed shot from outside the box is saved in the centre of the goal. Foul by Jayden Stockley (Cambridge United). Goal! Cambridge United 4, Carlisle United 0. Jayden Stockley (Cambridge United) header from the centre of the box to the top left corner. Assisted by Greg Taylor with a cross. Stephen Elliott (Carlisle United) wins a free kick in the defensive half. Substitution, Cambridge United. Jayden Stockley replaces Robbie Simpson. Corner, Cambridge United. Conceded by Sean O'Hanlon. Josh Gillies (Carlisle United) wins a free kick on the left wing. Substitution, Carlisle United. Kyle Dempsey replaces Billy Paynter. Attempt missed. Robbie Simpson (Cambridge United) right footed shot from outside the box is just a bit too high from a direct free kick. Foul by Billy Paynter (Carlisle United). Attempt missed. Tom Elliott (Cambridge United) right footed shot from a difficult angle and long range on the right is close, but misses to the right. Paul Thirlwell (Carlisle United) wins a free kick in the attacking half.